Hello Friends! 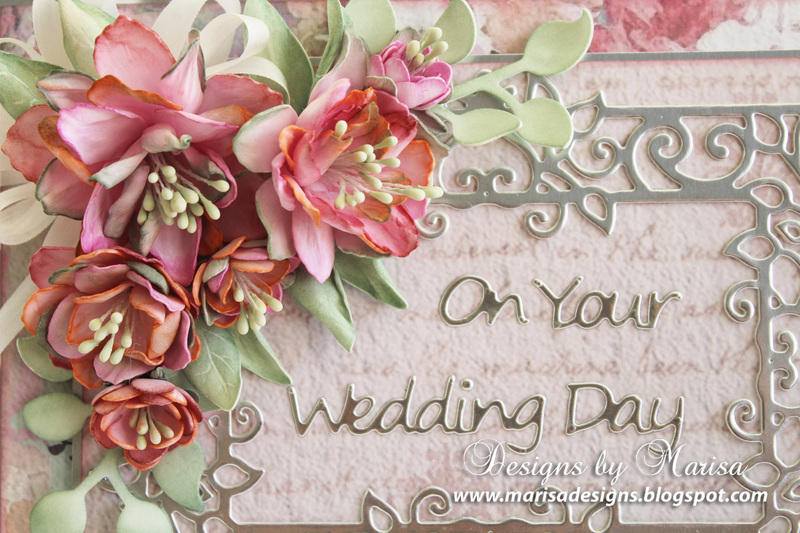 Today I would like to share my On Your Wedding Day card using several die sets from my Timeless Heart Collection. 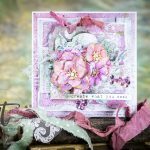 I have been having so much fun creating flowers with Textured Flowers Etched Dies. 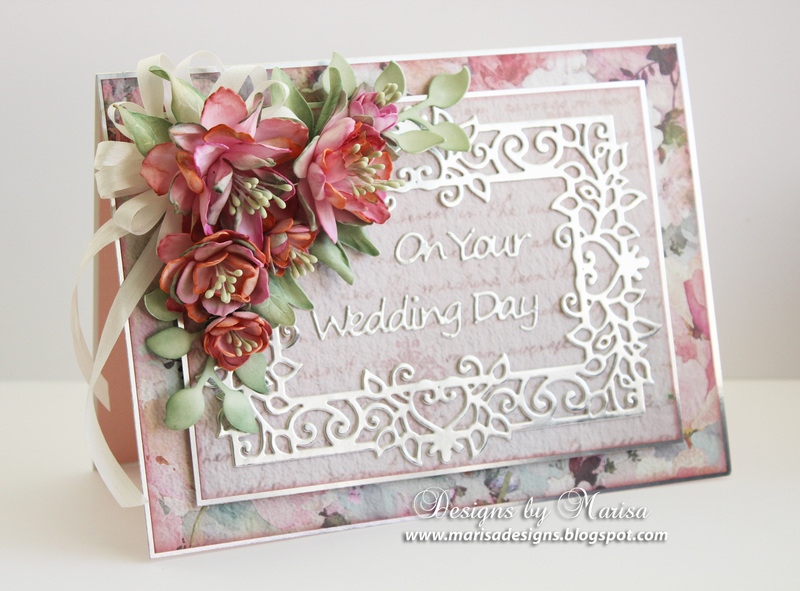 By adding Heart Leaf Frame, Layered Leaf Vines and Double Heart Gatefold Card Etched Dies, makes this card come together so beautiful! 1. 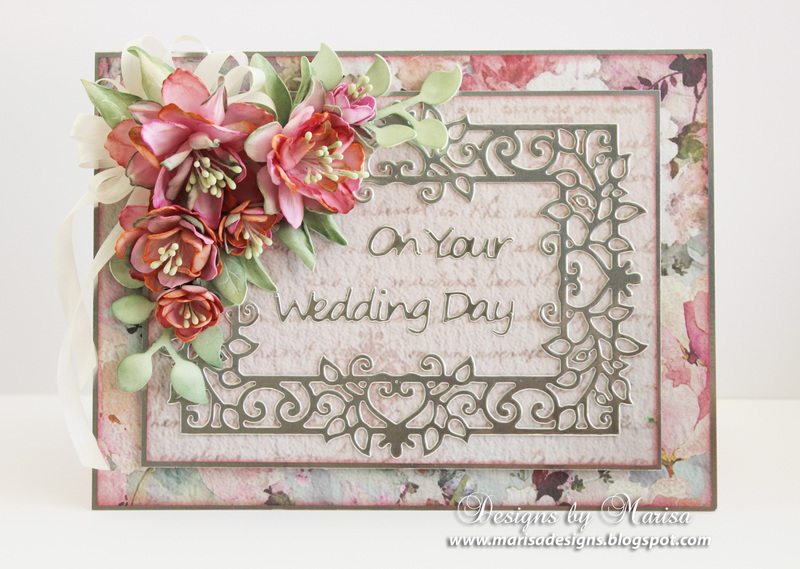 Create a 5 ½” x 7 ½” card base from silver foil cardstock. 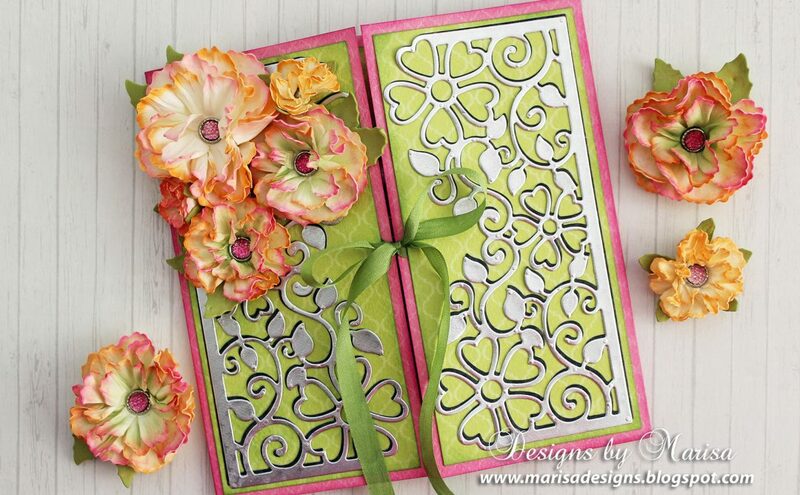 Cut a 5 ¼” x 7 ¼” piece from designer cardstock, adhere to card base. 2. Die cut Heart Leaf Frame from silver foil cardstock. 3. Cut a 4 1/2” x 6 ½” piece from designer cardstock, mat with silver foil cardstock and then adhere to card base using 3D foam squares. Glue Heart Leaf Frame on top. 4. 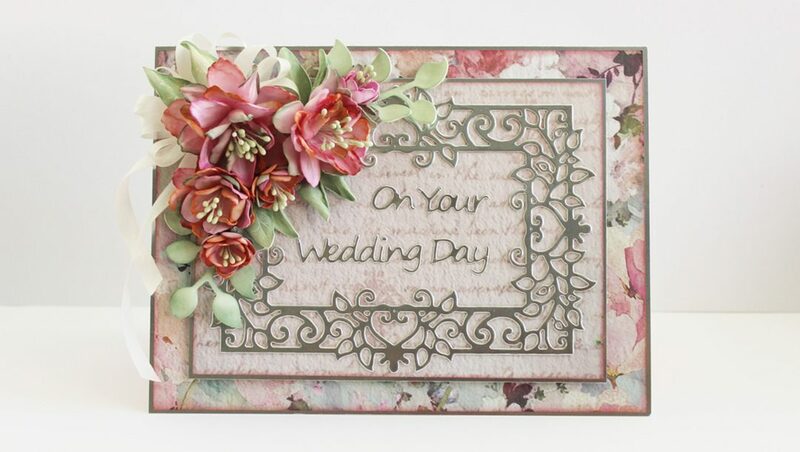 Die cut flowers with Textured Flowers die set from light pink Foamiran. I die cut 5 layers of the same size for each flower. 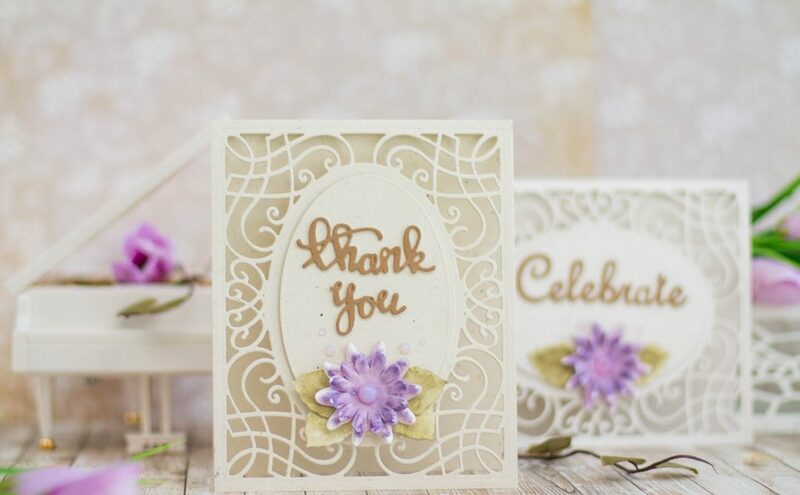 Foamiran is a paper-thin foam sheet that can be die cut using 4 layers at a time and then shaped into flowers with a heat tool. 5. Color edges of petals with chalk inks in green, orange and magenta colors. 6. Die cut leaves with Layered Leaf Vinesdie set from white Foamiran. Color with green chalk ink. 7. Heat flowers one at a time with heat tool for only a couple of seconds or until petals start curling up. Twist petals together while still warm and set aside. Continue doing the same with all flowers and leaves. 8. Untwist flowers and open petals as pictured below. 9. 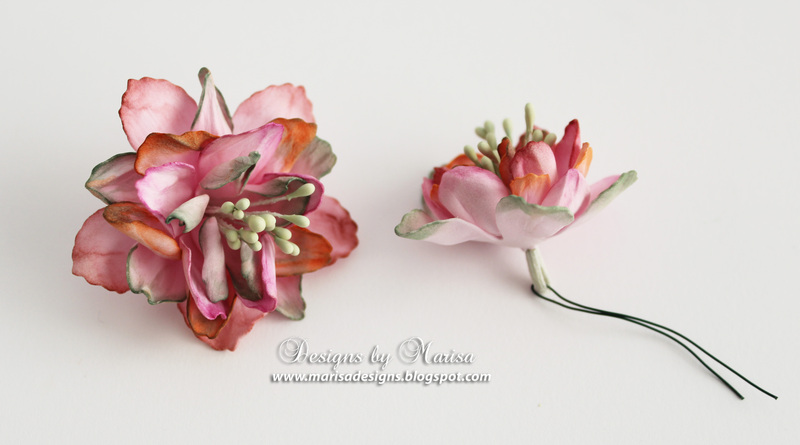 Layer flowers together using hot glue gun and pressing together in the center with stylus. Puncture a hole in the center of flower with Tool ‘N One. 10. Gather about 6 or 7 stamens together, fold in half with thin wire. 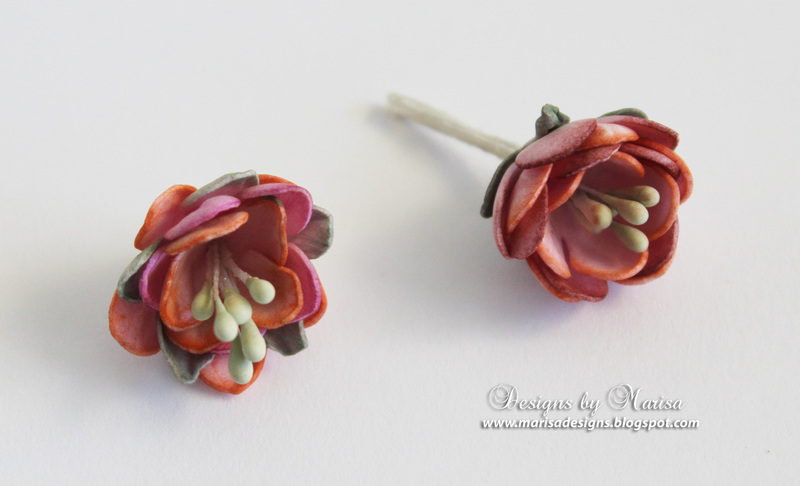 Pass stamens and wire through center of flower and then secure with hot glue at the base of the flower. 11. For the flower buds you only need 3 or 4 layers which you can warm with heat tool until they start curling up and then layer together. 12. 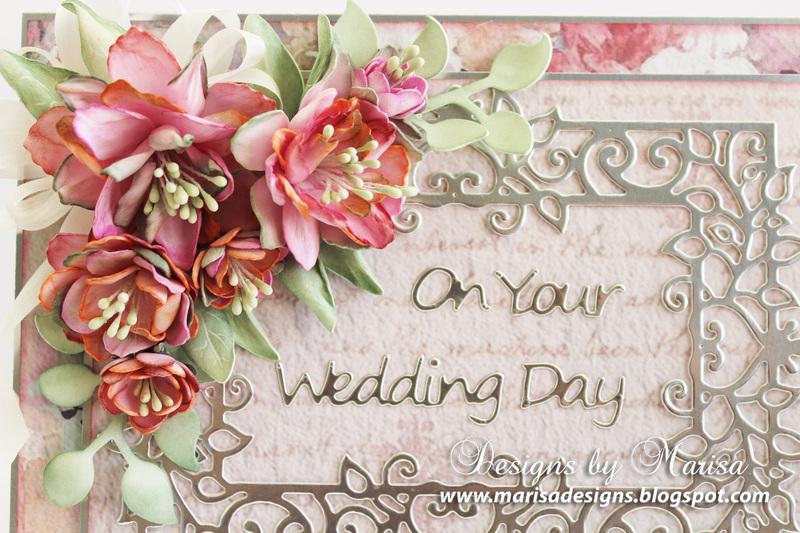 Die cut sentiment from Double Heart Gatefold Card die set using silver foil cardstock. Glue to center of frame. 13. 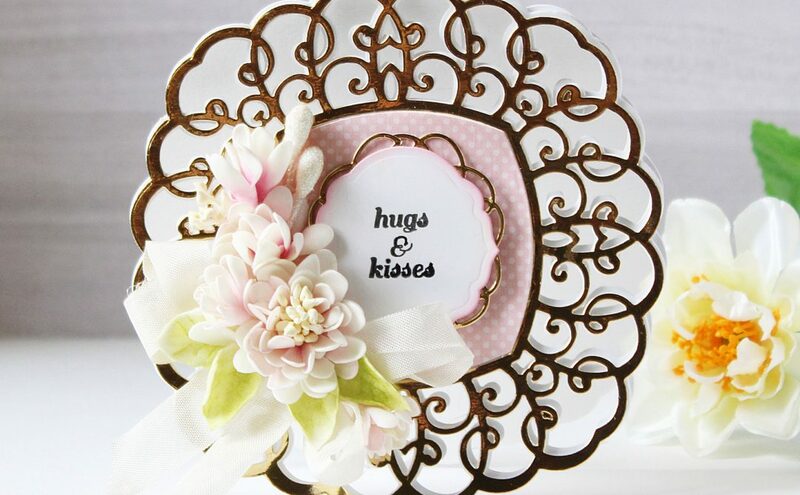 Arrange flowers and leaves together at the top corner of card and glue in place with hot glue gun. Make a bow with silk ribbon and glue under flowers. Other Supplies: Silver Foil Cardstock, FabScraps – Charms of Spring Paper Collection, Foamiran Ireland – Light Pink and white Foamiran Sheets and Stamens, Scrapbook Adhesive by 3L – 3D Foam Squares and E-Z Runner Grand, Prima Marketing Chalk Inks – Blossom Bud and Fall Leaf, Quick Quotes Powder Puff Chalk Ink – Sea Foam, May Arts White Silk Ribbon, Hot Glue Gun, 26 GA Floral wire. Thanks for visiting and have a wonderful week! Marisa Job has been crafting since growing up in Lima, Peru. Her parents were in the clothing industry where she learned to design and sew clothing. She received her degree in Fashion Design and Merchandising in LA. and spent the first few years of her career designing children’s clothing. 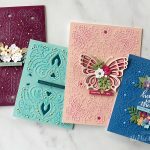 When she purchased her first rubber stamp she became immediately hooked and has now been involved with paper crafting for over twenty years. 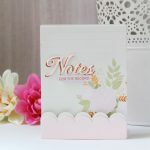 She has a passion for rubber stamping, die cutting, card making and scrapbooking which has led her to design dies and rubber stamps in the craft industry. She lives in Los Angeles, CA with her husband of 35 years. They have two daughters and three grandkids. When she’s not in her craft room, she enjoys spending time with her family and friends, going to the beach, sewing, reading and cooking. Absolutely beautiful – I just love your flowers. this is absolutely gorgeous, and I love the flowers too!! !